I had just finished trimming about fifty pieces of paper that I laminated and scraps were all over the table. My youngest son snuck up next to me and sat in the chair. 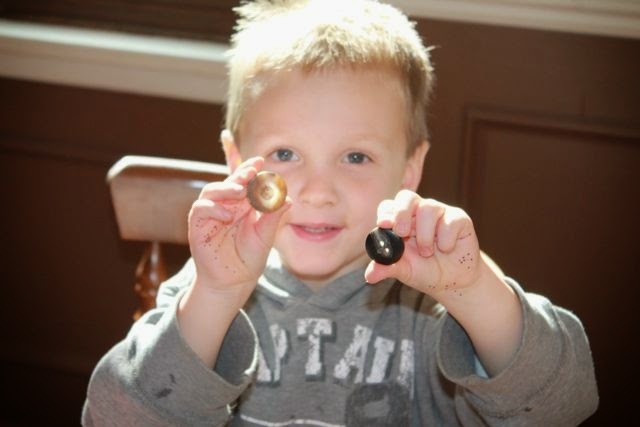 He said curiously, "What are those?" I replied, "Plastic scraps that I trimmed off the edges." I pushed the scraps toward him and said, "You should make something with them." He was sort of confused at first. His face said, "Make something. With those?" After about ten minutes, I came back to find him squirting glue on a folded piece of paper. 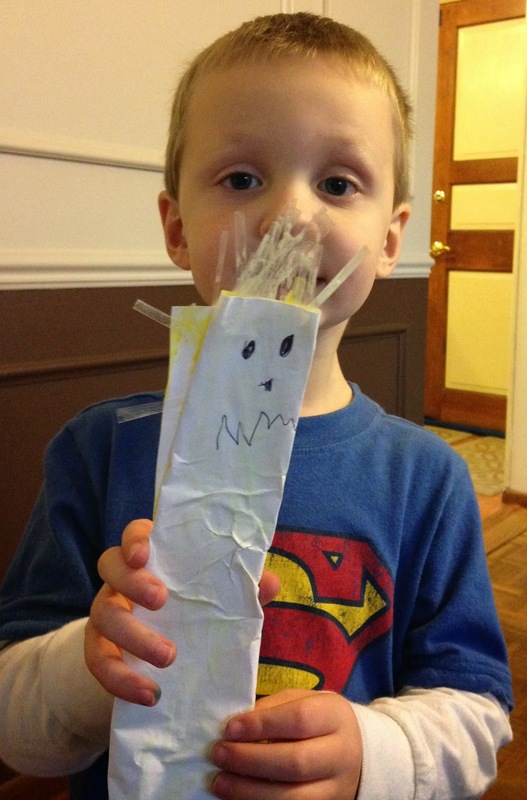 Then, I watched him fold the paper and draw a monster face. I was amazed. I saw only plastic scraps. He saw hair on a monster. Experiencing this with my son inspired me. I should be asking all my children, "Can you make something out of this?" The next day I went to the library and checked out Lois Ehlert's books, The Scraps Book: Notes from a Colorful Life and RRRalph. I wanted to read these two books to my children and then challenge them to make something out of scraps. 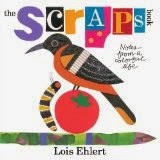 The Scraps Book: Notes from a Colorful Life is one of over 35 picture books published by Lois Ehlert. It is an autobiographical book highlighting her experience as a picture book artist. 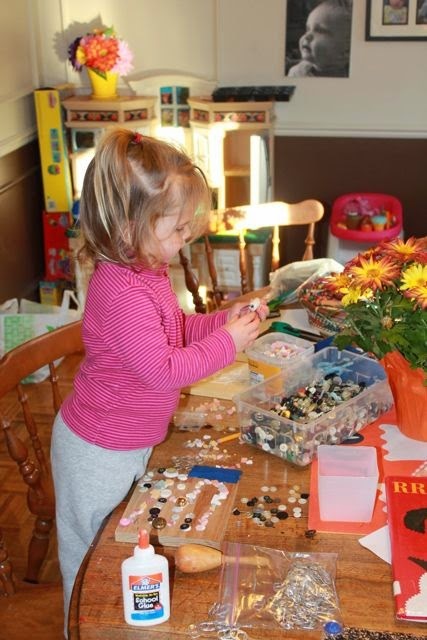 She begins by crediting her parents with having scraps available for her to create art at a young age; fabric and buttons from her mother and paint and wood from her father. Throughout the book, Ehlert shares photographs, sketches, and experiences that were important to creating her popular picture books. In an interview with BookPage she talked about the book, "My wish is that there will be little kids like I was, who read it and say, 'Well, if she can do it, I can do it.' It may take them 20 years. I was a relatively late bloomer." 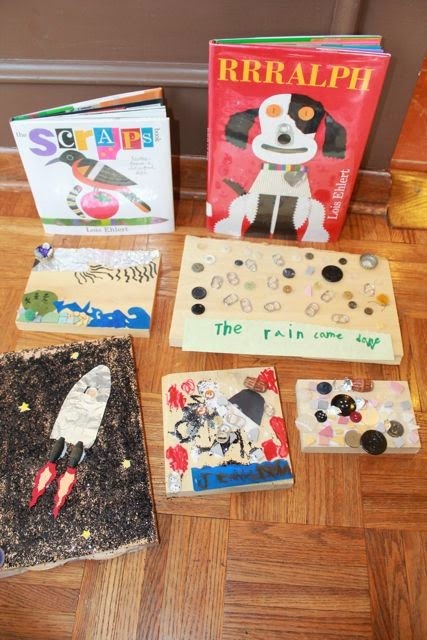 The Scraps Book is delightful and a must-read for all fans of Lois Ehlert. 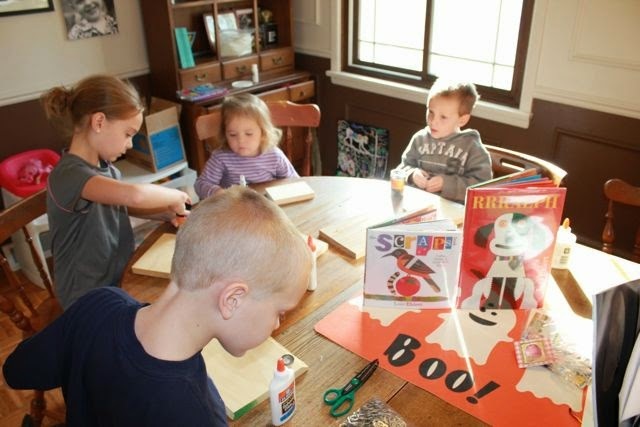 The Scraps Book was first book I read to my children before our make-something-from-scraps activity to celebrate Lois Ehlert's birthday. They learned that Lois Ehlert's art technique is collage and that she is messy when she creates her art. 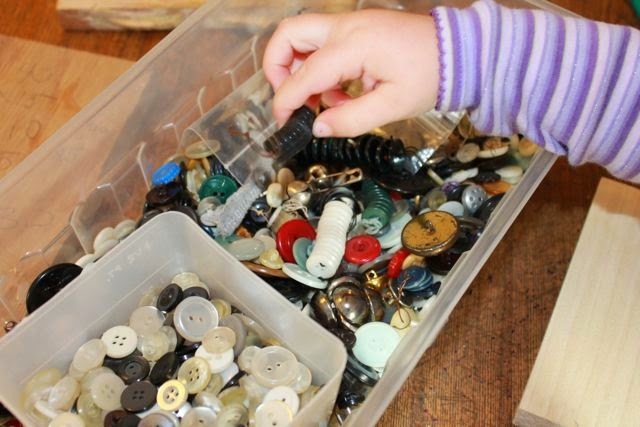 Also, they learned that she often uses "what's close at hand"; scraps of paper, real objects, or items from nature. After The Scraps Book, I quickly picked up RRRalph, a funny story about a talking dog, and read it too. My children were quick to point out in the illustrations that screws were used to make bird beaks, pop can tabs made dog noses, and buttons were eyes. 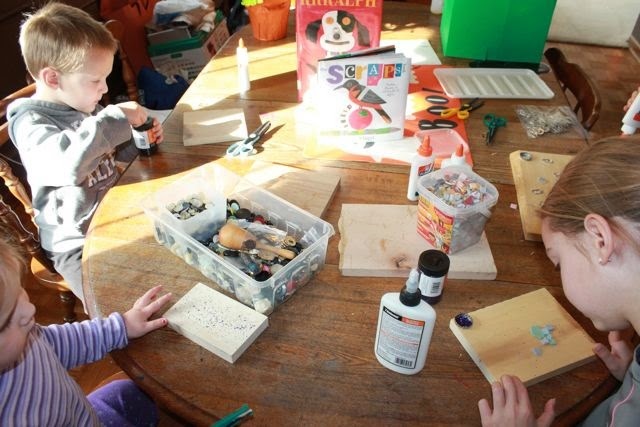 Lois Ehlert affirms, "You don't have to go to the art supply store for everything." (BookPage). All of my children were home from school on this day. It was Election Day and their schools were being used as polling stations. I felt blessed to have them all at home. Any more, my oldest two children are off at extracurricular activities or playing with friends. I started the day with this activity to make sure I didn't miss the opportunity to all work together. 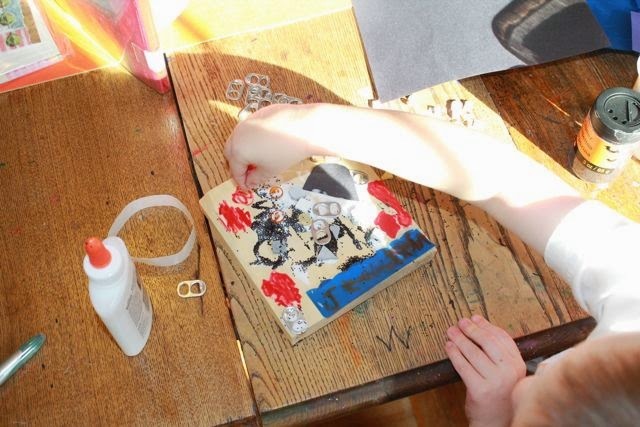 They all wanted to use scraps of wood from Grandpa as the canvas for their art. 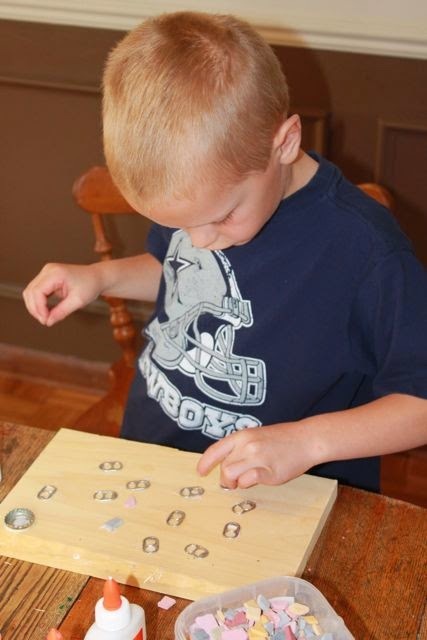 I provided buttons, broken scraps of mosaic tiles, glue, scrap paper, and glitter. I found many pop tabs in a junk drawer. I was reminded of them after reading RRRalph. They searched for the most unique buttons for their artwork. 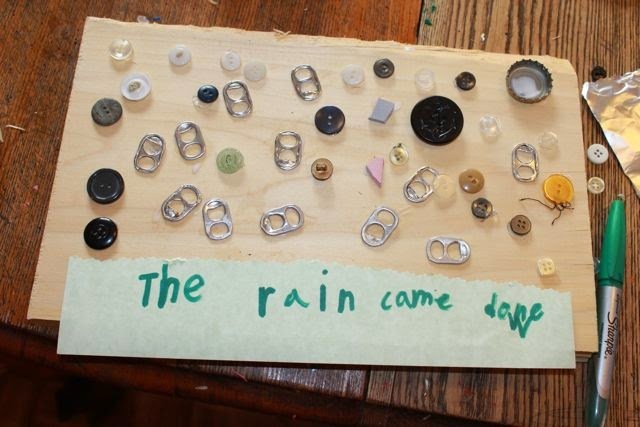 My oldest son glued the items in a random pattern to resemble rain. He may have been inspired by the book, THE RAIN CAME DOWN by David Shannon that we read last month! "Hey, Dad! Look at these!" My youngest son said his art was inspired by a Star Wars battle. Last year we celebrated Lois Ehlert's birthday too. As I looked back on the pictures from the celebration I was suprised to see how much my youngest daughter had grown in one year. She was using glue sticks last year and this year she used big kid glue! 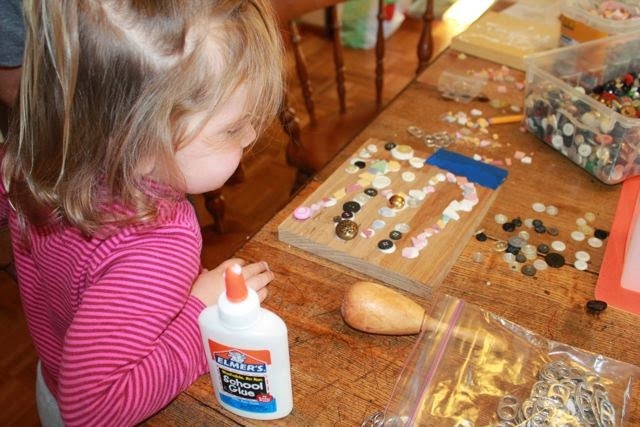 Buttons, glue, and a scrap piece of wood kept her busy for over an hour. Our dining room table was a mess. I cleaned it up only for it to be messed up again. 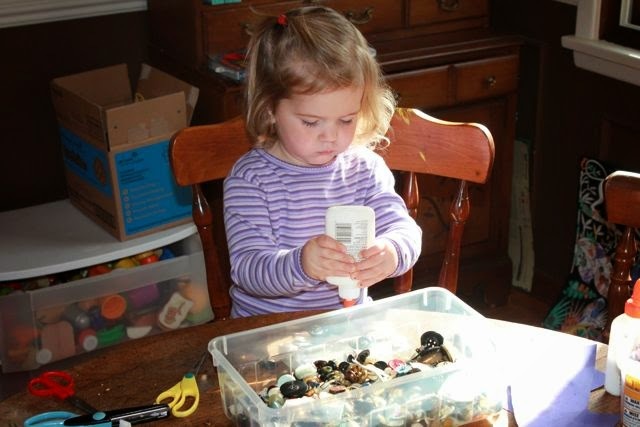 The next day she said, "I have to make something." She worked very hard and declared, "I'm all done." I hope our schools continue to be used for polling stations on Election Day. 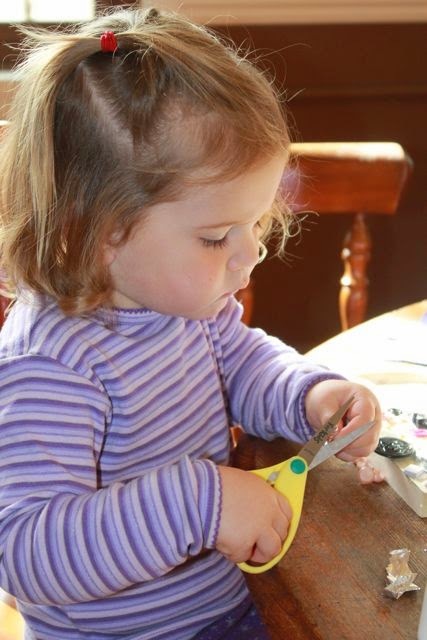 It would be a fun family tradition to read books by Lois Ehlert and make things out of scraps on their day off! 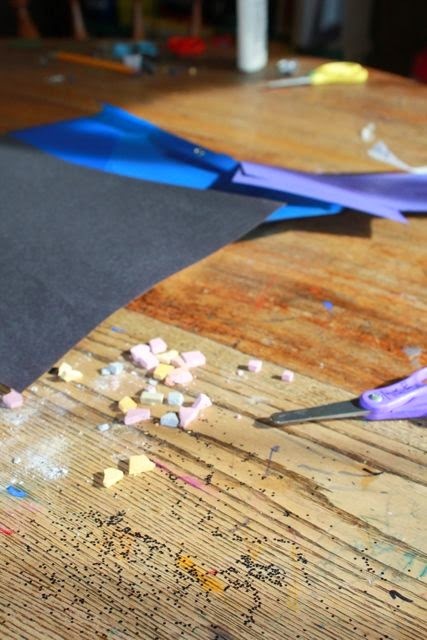 The next time you are about to throw away a few scraps I encourage you to set them aside. 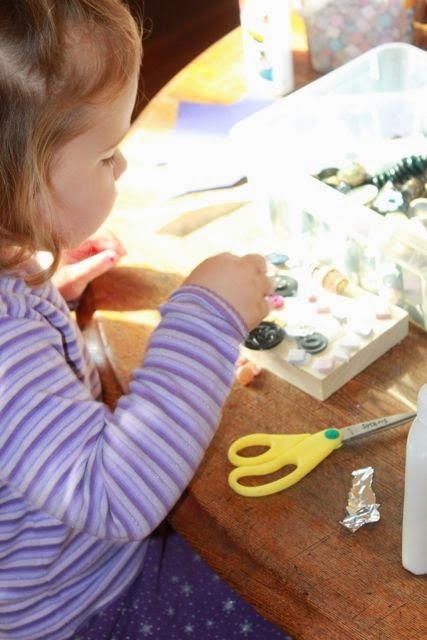 Maybe they could inspire a bit of creativity with your little ones.